The Hidden Glasgow Forums • View topic - Titan Crane Govan to be dismantled. Titan Crane Govan to be dismantled. ONE of the River Clyde's most historic and striking landmarks - The Titan Crane at Govan - will soon disappear from Glasgow's skyline. The crane, which dates back to 1911, is being dismantled piece by piece. Owners BAE Systems sanctioned the work after securing special planning permission to demolish the A-listed structure. Bosses claim the 200-tonne crane, which is no longer operational, will impede work on a £4billion defence contract and would cost more than £1.6million to refurbish. Contractors moved onto the site yesterday and will spend three weeks taking down the 170ft landmark, which was designed by Sir William Arrol, who also built the Forth Bridge and London's Tower Bridge. The Gearhouse/Counterbalance is already gone as of today. I read the article in the Times which you posted Mori, and found it very interesting. The sight of this "Titan Crane" towering over Govan is something with which I was long acquainted, and I can imagine its disappearance being something that will be readily noticed. One thing I find quite strange is that neither you nor the Times article, make any mention at all of the early name of the yard in which the crane is located, namely the yard once called Fairfields. The Times does mention a couple of the historic ships, the Empress of Japan and the Empress of Britain, but nary a mention of the name of the yard which built them (these ships were a part of Govan for a long long time and they were known in Govan, as Fairfield boats). Is there some reason for the Fairfields' name being avoided? It is purely a generation thing Dugald. My mother who stays in Govan and who is in her sixties still calls the yard Fairfields, as does the rest of the locals of her age group in Govan. I grew up in Govan through the seventies and we called it Fairfields or Govan Shipbuilders as it had that name painted across it in large letters. The media usually call it by what it is known by at the time such as Kvaerner or now BAE Govan. I remember being taken around it by my Grandfather at a family open day in the early seventies when i was about eight. It was like something out of the dark ages. Then when i was leaving school at seventeen, i got the tour from the Careers Service about potential apprenticeships. The yard had even in that short time of about ten years come on leaps and bounds in terms of Health and Safety and working practices. I am glad to see the yard working well with the old Yarrows Yard and that it is so busy. But when i see the yard from the Clydeside Expressway i sometimes think there must be WWIII in the planning given the amount of Royal Navy vessels it seems to churn out. Thank you for the explanation regarding the use of the name Fairfields Socceroo. Yes, I dare say the absence of "Fairfields" is a generation thing. Interesting too, that you grew up in Govan... and I'm happy to learn, thanks to your mother, that I'm not the only one who still thinks of the yard as Fairfields. You did something I had never been able to do--you got inside Fairfields' yard. I never saw the inside of the yard until many years after I'd left Govan, and that was from the deck of MacBraynes' Queen Mary II as she sailed down the Clyde. I have a book (published in the 90's, author Jack Webster) of pictures of Clyde-built ships which I bought on the Waverley some years ago, and the book uses the name Fairfields throughout. I mention this only because I noticed in the book that the Empress of Britain was built by John Browns yard rather than Fairfields, as erroneously mentioned in my previous posting on this thread. The Empress of Scotland (originally the Empress of Japan) was built at Fairfields, and I recall her, quite clearly, towering over the Govan Rd... but I'm happy to add, when she was being refurbished after wartime trooping, rather than when she was being built. It's good to hear there is lots of yard work on the Clyde, but I hope you're wrong about the planning for WWIII! Cheers. 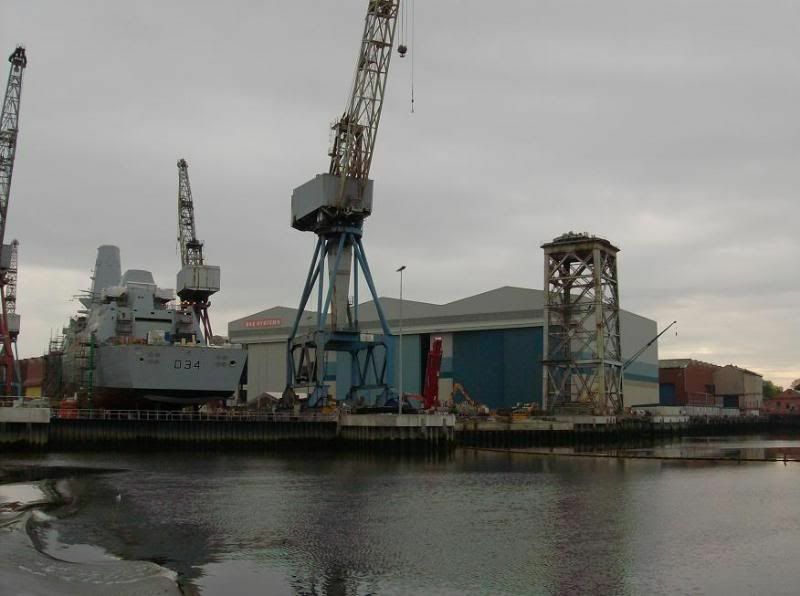 Re: Titan Crane Govan to be dismantled. Went past yesterday and it had been decapitated. Titans listed status was removed when Kvaerner took over the yard .. I'm not sure if that permission has lapsed and had to be re-applied for by BAE but Kvaerner always had the idea of removing Titan from the 'kick-off'. They wanted to dismantle it as they were attempting to remove all of the old character from the yard citing 'lack of morale in the workforce' as a driving force, wanting a 'new broom sweeps clean' ethos throughout the bears. They were forced to re-think things when they found Titan (and Noddy, her sister crane) were the only lifting apparatus capable of lifting the 150 tonne units for the then forthcoming bulk gas carrier contracts. £2 million is a drop in the ocean for BAE and I can only hope their short-sightedness doesn't create problems with future contracts. My Pop had made his way up from Journeyman to Engineering Services General manager from the year dot up until a couple of years back and he was saying this morning that there aren't even any other plans in the pipeline to replace the static heavy lifting apparatus with equivalent modern rail jobs. The fact that Titan is positioned at the only remaining section of the wharf which is of timber construction leads me to think there may well be some sort of reconstruction planned for the 'new contracts'. But it also makes me think what the new work will be .. as any work on RN ships planned at present is all based around Type 45 Daring class (Dauntless, Daring, Diamond etc.) and doesn't need any sort of special slipway, hardened berth or the like. I started my apprenticeship in June 1961 at Fairfield Shipbuilding and Engineering Company Ltd, and when I finished my time in July 1966 it was Fairfield (Glasgow). (I got a month added on for dogging off for snooker etc!). Among some of the non shipbuilding work I got involved with was a rolling road for the polis to set up their vehicle speedos. Probably for Helen St.
Great place for a fitter to serve their time. We made boilers, steam turbines, gear boxes, and slow speed diesels. In 1961, the last, (I think), marine steam reciprocating engines built in the UK were made for the 9 ferries built for Turkey. Sorry to see the Titan go, but we can't keep them all. The final piece of the crane was lowered today at 6pm, The yard seems so empty without it now.